Volunteers really do make it happen. Clatsop Animal Assistance supports the Clatsop County Animal Shelter by providing funds and volunteers to enhance the health and welfare of the animals staying at the shelter. Volunteers do their best to treat the animals at the County Animals Shelter as lodgers, not prisoners. Without our volunteers, the animal shelter experience would be entirely different. There would be no socialization, no walks, no outings, and no funds for the surgeries and veterinary care that make our animals more adoptable. Animal health and welfare would suffer. Frankly, without volunteers it is doubtful our shelter could maintain the extraordinarily high rate of survival and adoption that our shelter has. When you volunteer for Clatsop Animal Assistance, you make a very real and concrete difference in the world. It’s a difference you can see as frightened newcomers come out of their shells and begin to look forward to visitors. It’s a difference you can see when one of the animals finds a new home. It’s a difference you can feel when an animal you once thought was not adoptable wins the heart and home of a visitor who can see past limitations to see the opportunity and the beauty standing before them. Our shelter dogs get to stay as long as it takes to find them good homes. That’s great, right? Yes, it is! But … dogs are social beings. They need human interaction to keep up their social skills; and they need physical activity to remain both physically and mentally healthy. Clatsop Animal Assistance (CAA) provides virtually all of these labor hours at the Clatsop County Animal Shelter; so, if dogs are going to walk, we have to do it. We need more walkers. Having someone walk dogs just a few hours a week, an hour at a time, can mean the difference between every dog getting a walk or not. We really strive to get them two walks a day for exercise and for potty activities. Some dogs simply will not “potty” in the kennel and will hold it. So, walking is very important for dogs. If you can spare a few hours a week, even just an hour at a time, it will help we who are stretched thin already but–more importantly–it will make a huge contribution to the physical and mental health of a dog. The link to a volunteer application form is at the bottom of this page. If you LOVE Cats, we Love YOU! Not only do we love you, we need you! Our cats need you! We’re seeking volunteers to help care for and adopt out our cats. Volunteers will work either the morning or afternoon shift, one day a week. The morning shift involves cleaning cat cages and providing socialization (playing, petting) to the cats. Morning volunteers work in pairs. The cleaning takes approximately one and one half hour for two persons. Typically, volunteers begin cleaning around 9:00 am-9:30 am. The morning shift runs until 12:00 noon if you stay to socialize the cats, and we encourage this. The afternoon shift runs from noon to 4:00 pm and you’ll be expected to be in the Cat Room those hours. 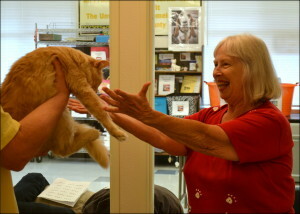 The afternoon volunteers greet the public and help match potential adopters with the right cat. The afternoon shift also provides time for cat socialization. All new Cat Volunteers attend an Orientation Session which provides general information about the Shelter. Training on the Cat Room procedures, both morning cleaning and afternoon adoption, is provided by one of the Cat Volunteer Trainers. Our volunteers tell us they appreciate the opportunity to work at the Shelter, treasuring not only our cats and dogs, but the other people who volunteer as well as work for us. So if you don’t mind falling in love with a fabulous feline from time to time (actually, maybe, more like every other day!). Call the shelter at 503-861-7387 to reserve a spot at our next orientation. Whether you like cuddling with cats, walking dogs, or prefer helping in the office, we need you. The shelter is located at 1315 SE 19th St., across from the Oregon Youth Authority North Coast Youth Facility. From either direction, take 101 to Ensign, then go past Costco, turn right, and go about 1/4 mile. The shelter is on your left. Click here to watch a short video we just completed. It will give you an idea of the kinds of things we do and the enthusiasm our volunteers have for the shelter and the animals.